There's no need to worry about too much walking between the destinations (especially if it's rainy and grey, like it was on the day we did ours!) because you get ferried between each location on the "Gin Carriage", which was basically just a bus. But Gin Carriage sounds loads better right?! There are only ever between 20-25 people on the tour, so it felt really intimate and we had chance to chat with the guide and other attendees. Our first location and meeting spot was Furnival's Well, a bar in the Ropewalks area of Liverpool. It took us a little while to find this place as it was quite tucked away, but when we did, we weren't disappointed as it was such a fab bar! Set in an old police station, Furnival's Well is full of character and charm - from the blue light that still sits above the entrance to the seating booths that are built into the old prison cells. 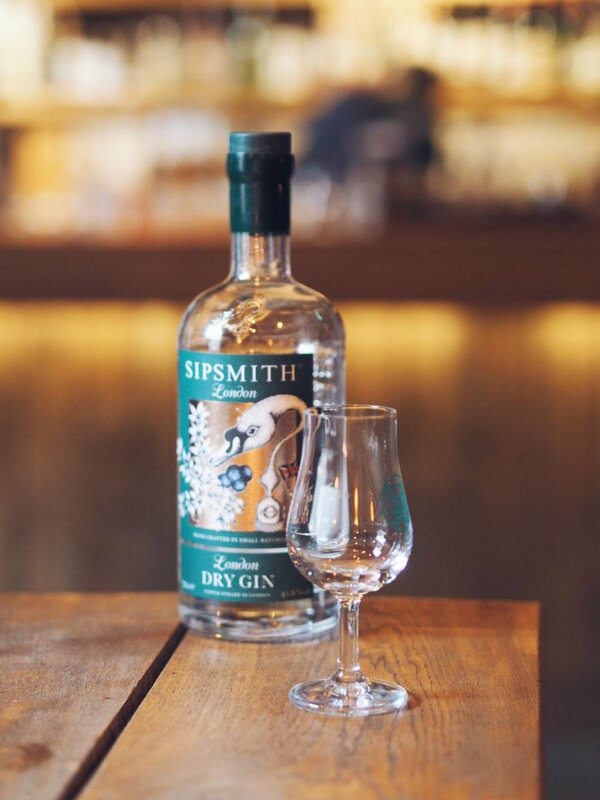 We found a seat and the tour began with a quick chat about Sipsmith gin, which is the brand credited with reviving the gin scene and inspiring all the craft gin brands that have popped up over the last few years (nice work, Sipsmith!). We each had a little taste of the gin, with instructions from our guide on what to look for, and then our first cocktails arrived. This was one of my faves of the whole day, and one Sam and I have been trying to recreate at home - it was a concoction involving gin, ginger ale and Angosturra bitters. Delish! Before long it was time for us to hop on board the gin carriage and make our way to our second destination - Buyer's Club. This place was absolutely gorgeous and is a bar I'll definitely be visiting again soon - think exposed brick, rustic tables and plenty of plants. A blogger's dream! The food menu also looked super yummy and the charcuterie board we tried while waiting for our drinks was delicious. The cocktail we had there was made with Liverpool gin, violet liquor and mint - it tasted just like Parma Violet sweets which were my absolute fave when I was little. I really want to try and recreate this one at home - I think it would be perfect sipped in the garden on a hot sunny day. Next up was a bar Sam and I visited on our last trip to Liverpool, Ex Directory. It's a speak-easy style bar and you have to enter through a phone box before heading down a flight of stairs. I love the excitement of trying to find these kinds of secret bars and Ex Directory has a really cool atmosphere and style once you're in. The cocktail we had here was almost like a margarita made with gin - think lots of lime and a Mexican twist! Margaritas are one of my favourite cocktails so this suited me to a tee. They were also served with smoky chipotle popcorn which was absolutely perfect. We were soon back on the bus again and off to one of my favourite parts of Liverpool - Bold Street! This street is home to some of my favourite bars and restaurants and now I can add Dia + Noche to that list. It's such a lovely bar with a really great atmosphere and Sam and I vowed to return soon. The cocktail we had here was a bit of a twist on a Bramble and it was absolutely delicious - it had a really fruity flavour and the crushed ice kept it nice and cool. I also loved the crystal glasses they were served in - we have some similar ones at home so I think I'll need to have a go at making a similar drink! The last bar we visited on our journey was another hidden one called Some Place. Located on Seel Street, this is a bar I'd struggle to find again - both because it was very inconspicuous and because I was more than a little bit tipsy by the time we arrived! It had a lovely cosy atmosphere - think dim lights and cosy settings.